With the nights now drawing in and it definitely feeling colder it seems like the right time to indulge in comfy slippers, a duvet and stay in watching Doctor Who (well unless you really want to go out Christmas shopping which I’m putting off until the last minute!) so the other night I went classic black and white and decided to put on the 1968 story The Web of Fear into the DVD player. Despite a merry go round of swapping in the script editor chair for in Season 5 (Victor Pemberton-The Tomb of the Cybermen) (Peter Bryant The Abominable Snowmen, The Ice Warriors, The Enemy of the World) Derrick Sherwin ( The Web of Fear, Fury from the Deep ) the producers Peter Bryant and Innes Lloyd probably held court to one of the strongest and greatest seasons ever of classic Doctor Who. Of forty episodes comprising Season 5 eighteen are missing. That’s 45% of this season but but but one of the greatest joys of being a Doctor Who fan for me is seeing the return of missing episodes. This story was probably one of the most revered and wanted stories for fans, elevated to legendary status when most of it was missing. I suppose unlike its neighbour, Enemy of the World, which had the luxury that no one had any huge expectations of it just by looking at Episode 3 ( by the way I do completely adore Enemy of the World for many reasons ) with this story one expected so much and for the most part it delivers magnificently. It is a busy script using all the raw ingredients of a base under siege story with sharply written characters and which also introduces someone who will be a beloved regular character. A successful story mix of aliens running around recognisable landmarks which will be repeated again over the following year in ‘The Invasion’ as we have Cybermen marching down St Paul’s cathedral. In ‘Rose’Russell T Davies pays his own homage to this formula that will be used many times in the next ten years as the Nestene Conciousness use the London Eye as a receiver to control the Autons. The first five minutes of ‘Web of Fear’ where we go to Julius’s museum looks utterly amazing. Douglas Camfield is a master stylistically with close ups and high angles, playing with shadow magnificently giving due reverence to everything that’s rich about using black and white film. I get a sense that he was paying homage to the film style of Citizen Kane here but maybe that’s my imagining. Anyway it takes my breathe away every time I see that beginning section as it has the texture and atmosphere of those old horror films 1940’s films. I also like how Douglas uses scene fade outs interspersed throughout the story. It’s something that seems to be used sparingly in Who but it’s so effective and I wish directors would use it more. The score is suitably creepy and menacing and watching late at night I can imagine Bela Lugosi might even make an appearance. The score was stock music but it so so works all the way through. Big shout out for the sense of doom it provokes. The Web of Fear script manages builds the sense of menace and paranoia through the story. It’s bleak and scary. The Great Intelligence speaking through Travers is creepy as the idea of something you can’t see taking control of a body and using it is intimidating. When Chorley comes out of hiding he sees Staff Arnold. Chorley goes into a long ramble and is basically frightened and we don’t know who the traitor but if you watch Staff when he says ‘It’s all right, sir. Nothing to be ashamed of ’ which could be a word of comfort maybe but the look in Staff’s eyes is hard as steel. Absolutely chilling. Oh, poor fellow Sergeant Arnold! The Doctor is extremely watchable in this story. I love the mysterious air he exudes as suspicion and paranoia is layered up through the episodes about who is the enemy within. Everyone is a suspect in the Doctor’s eyes even our colonel Alistair Lethbridge Stewart. He seems to be constantly calculating how to defeat his enemy. The Doctor gives a truly memorable description of the Great Intelligence ‘a sort of formless, shapeless thing floating about in space like a cloud of mist, only with a mind and will.’By this stage we had lost the visual comedy of his first season with the different hats and costumes thank heavens. Season 5 was Patrick Troughton definitely in his stride.Pat Troughton was such a good actor he was able to effortlessly create different sides to the Doctor. He is a warm, assuring presence so much of the time that I really enjoy when we see him displaying little more cunning. He makes it appear that he is willing to sacrifice himself so the others can survive when he has a plan up his sleeve to exhaust the Great Intelligence. I rather like his anger and sorrow that he is inadvertently thwarted and fails to defeat his enemy. He’s at once the angry parent but then soothed with a few praises to believe he is a hero. The mysterious way Alistair Lethbridge Stewart just appears is a very exciting moment considering how long his character is involved with the Doctor on screen and also with the companions ( well over 20 years) and becomes a part of the Doctor Who mythos . He just appears in Episode 3 and one wonders how he and the Doctor just came upon each other. 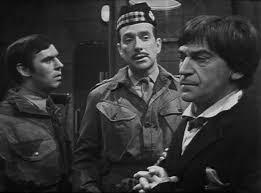 But I like this Lethbridge Stewart character, decisive, practical, brave, a man of action. It’s not a meeting of minds but he is willing to take on that the Doctor has a space time ship that can help them escape as the Yeti close in. He’s a man who will try anything to protect the lives of his soldiers, will take any solution, however unlikely, to this crisis. I love Chorley’s and Anne’s spat in Episode 3 where he calls her a ‘smug little red brick university’ because you don’t really get that kind of verbal sparring anymore generally about social positioning. I like that Anne is a bit waspish in her flirting with Captain Knight, who soon loses his authority when Colonel Lethbridge Stewart arrives, also proposing to her father that the Doctor is responsible for sabotage adds another edge to her. 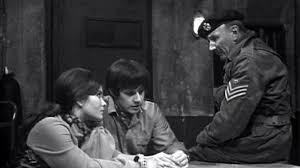 The script also has some great characterisation and interaction amongst the trapped soldiers Staff, Evans, Weams are all different types of soldiers who feel authentic. Staff, salt of the earth, and then there’s Evans who will do anything to save his own skin. This story has two of my favourite team of companions Jamie and Victoria together. Although the regulars have real chemistry between them Jamie however gets a better role than Victoria in this story. Jamie is quite a shrewd character I think, not brainy in the conventional way but he has common sense and sums up Evans pretty accurately. Evans is one of life’s survivors, the coward. Predictivel of his kind as all the soldiers die in Covent Garden killed by the yetis he along with Chorley lives to the end. Victoria isn’t well served written as a frightened character for much of the time, wandering the train tunnels, looking for the Doctor or as a prisoner of the Great Intelligence. As a Victorian young lady however she provide a nice counterpoint to the modern Anne as to how far women attitudes will change as the Doctor and Anne work together. The 1960’s were the start of an era of sexual and economic liberation for women, Anne represents the independent woman going out striving to achieve equality The Doctor and Anne together incidentally is an interesting early mirror of the later 3rd Doctor and Liz partnership that has many positive possibilities. Anne is an early Liz Shaw ? If there is one thing that stops this story being a 10/10 and perfect is the conclusion to defeat the Great Intelligence. It all happens rather quickly in the last ten minutes and then the Doctor is off like a shot, not even hanging around to speak to his friend Travers. I suppose he really doesn’t want Chorley to publicise his presence or the Tardis or maybe he is just impatient to move on and leave the clearing up to other people but it is a true shame after everything that happens. Despite the rushed ending however I still think this story is special. The London underground is instantly recognisable and has a history going back to a period of national importance which people in the 1960’s would remember. As Arnold says. ‘Oh, this place has been here a long time’‘It were a transit camp in the Second World War.’ The whole story resonated within the public consciousness with its rich dark script and visually memorable imagery of mixing monsters with landmarks. Everyone of a certain age remembered the story of the ‘yetis in the underground’.